This book is the slowest of slow burns. Practically the entire time I was reading it, I felt like I wasn't quite grasping all the details. It didn't help that I was reading in brief snatches of time here and there—over my lunch break as I munched a pb&j, for ten minutes at my desk if I arrived early to work, in between chatting with my husband while we were getting dinner ready. That's the kind of reading time my life is allowing me these days, but it's not the best way to read this book. Church of Marvels would be best enjoyed in long, leisurely swaths, so that the spidery threads of story have room to unwind without getting hopelessly tangled. If you find yourself in a place where you can read for a solid couple of hours at once, then by all means seize the opportunity. Maybe unlike me, you won't get quite so lost among all the overlapping characters and the tiny details that define them. I'll admit to some frustration as I struggled to make sense of how the various players relate to one another. But oh, the payoff is so good. I reached the Epilogue, and my mind was completely blown. Every single seemingly throwaway detail converged into a beautiful, complete whole, and I forgave Leslie Parry all the confusion and consternation she had caused me. 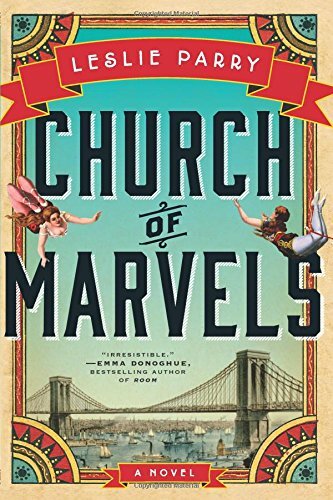 Church of Marvels is set in 1895 New York City. A young man named Sylvan finds a baby, discarded in a privy but still miraculously alive, as he works as a night soiler. Odile, a young woman with a twisted spine and a limp, works on Coney Island in a circus-style knife-throwing act. Alphie thought her life was finally looking up after she married a man she loved and moved into his mother's home, but now she's been committed to an asylum with dwindling hopes of rescue. All the characters are connected, but the myriad ways in which that turns out to be true aren't revealed until practically the final pages. The novel is very dark, atmospheric, the seamy underbelly of turn-of-the-century New York laid bare. Parry does some sophisticated stuff with gender identity and sexuality, and imagines one of the most interesting pairs of sisters I've ever read. And who can turn down a book about carnies—sword swallowers, contortionists, trapeze artists? Not me! If you can be just a little patient with it, this book will blow the socks right off your feet. With regards to Two Roads and NetGalley for the advance copy. On sale today, May 5! TagsA Touch of Melancholy, Baby Mama Drama, Bittersweet Life, Choices With Far-Reaching Consequences, Complicated Sisterhood, Convoluted Mysteries, Feeling Big Feelings, Gender Issues, Journey to the Past, Keeping Secrets, LGBTQ, Living at the Funny Farm, Mamas and Papas, Nonlinear Storytelling, Patience Required, Plucky Young Girls, Seeking Atonement, Seemingly Disparate Threads Coming Together, They're Twins!